As with other oil-based products, exercise care in timing applications to early morning/late evening to minimize potential for leaf burns. Do not apply to wilted or otherwise stressed plants, or to newly transplanted materials or crops prior to root establishments. Do not apply to known sensitive plant species, such as impatiens flowers, fuchsia flowers, hibiscus flowers, some rose flowers, ornamental olive trees, or some carnation varieties without prior testing. For optimal performance, do not mix with cold water (less than 45°F). Do not add adjuvants (spreaders, stickers, extenders, etc.) to Garden Defense Concentrate. For best results, maintain constant agitation in spray equipment. Use spray solutions within several hours of preparation for maximum effectiveness. Do not store diluted solution for later use. 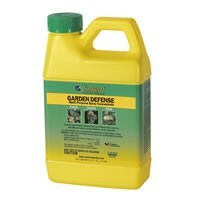 RATE OF APPLICATION: Mix Garden Defense Concentrate at the rate of 2 tablespoons (1 fl. oz.) per gallon of water. Thoroughly mix solution and spray all plant surfaces (including undersides of leaves) until completely wet. Frequently mix solution as you spray.